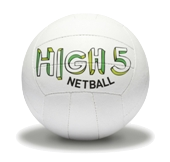 High Five Netball provides the link between First Step Netball and the full 7-a-side rules. The rules have been modified to allow players greater freedom around the court and to give them more time in which to make their decisions and to act upon them. The game encourages maximum participation from those involved and introduces the roles of scorers, timekeepers and centre pass markers. England Netball believe the game sits well with the requirement of Key Stage 2 of the National Curriculum for girls and boys in Years 5 and 6, (aged 9-11 years) and it is the only game to be played by players of this age.